What benefit do you feel the BID brings to Canterbury? There are huge benefits from working with BID – without it, Canterbury would be a very different place. On my way through Canterbury today I spotted my two town centre officers, Whitefriars security officers and the two BID Ambassadors. This provides the public with general reassurance, seeing the variety of uniform in the city. Then there is the wider picture that BID is involved with: interacting with the people that find themselves homeless and dealing with shop theft. As a youth ambassador I work really hard to try to look at the kids best interests, and understand what led to the crime. There are really good initiatives going on between BID, the police, the council looking at the much more holistic view, not just looking at criminalising people but also safeguarding young children. It’s no secret that the policing budget has been cut for many years, and that makes our job at times very difficult so this kind of working relationship really helps and is absolutely vital to community safety. Counter terrorism – no intelligence that Canterbury is under threat but could potentially be a target like any other city or town in the UK. How would it cope in the initial 10 minutes of an incident starting? Free Project Argus training is going to be arranged for businesses to help us all to understand what the policing response would look like and what can be done in those vital early stages. Westgate Gardens / Dane John are still areas with issues of antisocial behavior. County lines are operating in the city but again no more so than any other city or town in the UK. We have a team dedicated to shutting them down and keeping people safe against their activities. Activities in the Westgate Gardens has led to numerous arrests and a house closure for example. Sexual offending – pleased to see a significant reduction. 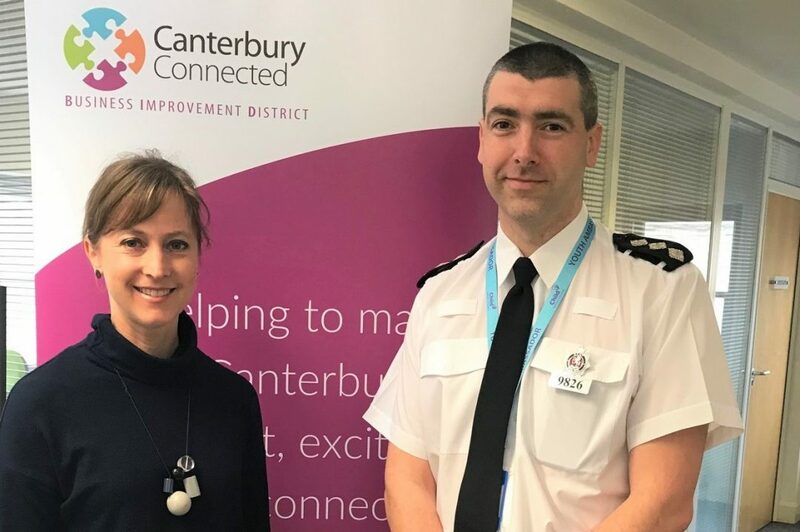 We held another pop-up hub on the 16 March where police and our partners handed out advice and support to keep safe to those enjoying the city of Canterbury. Homelessness – while the police can give out fix penalty notices, we are also working with other support agencies to support those who need wider partnership support to address their issues. In an emergency always call 999, for non-emergencies call 101 or report a crime online. No matter the scale of the crime, every report provides the police with evidence to tackle issues we face in our city.